3 Garnets & 2 Sapphires: Is It Too Early to Think Stocking Stuffers? New Crazy Aaron's Thinking Putties are Here! 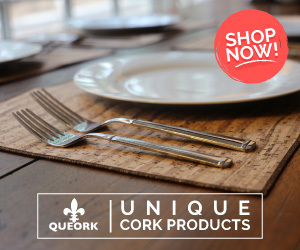 Is It Too Early to Think Stocking Stuffers? New Crazy Aaron's Thinking Putties are Here! 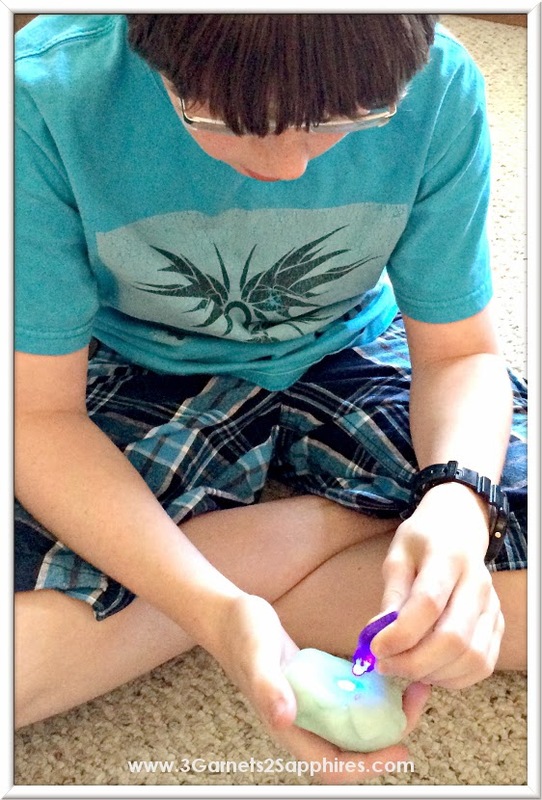 Thank you to Crazy Aaron's Putty World for providing samples of Thinking Putty for us to base this review upon. All opinions are our own. 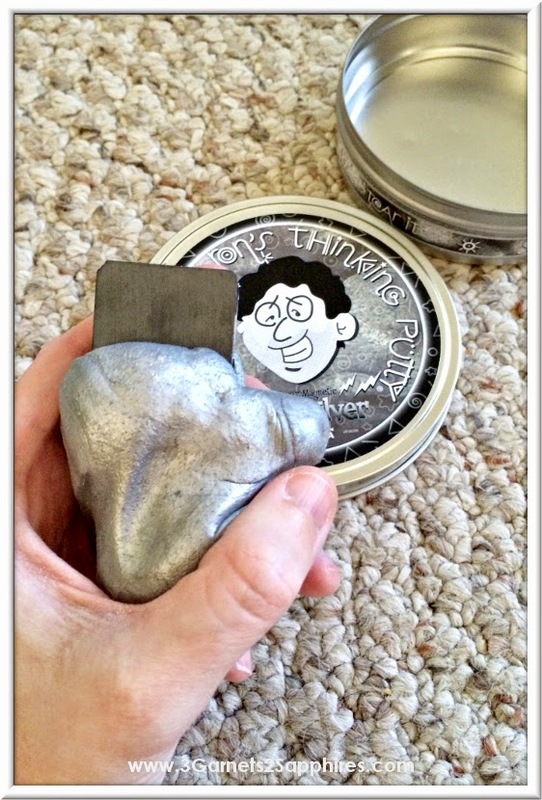 Crazy Aaron’s Thinking Putty has long been a favorite nontoxic tactile fidget activity in our home. 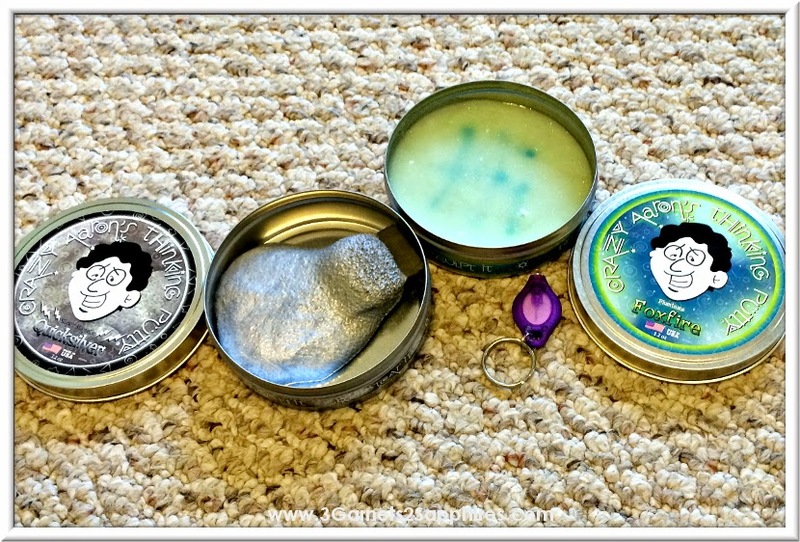 Our first Thinking Putty was a small tin of it and both my kids love the way it felt and how strong and flexible it was. We’ve owned other kinds of Thinking Putty since our first, and we’ve always loved them. 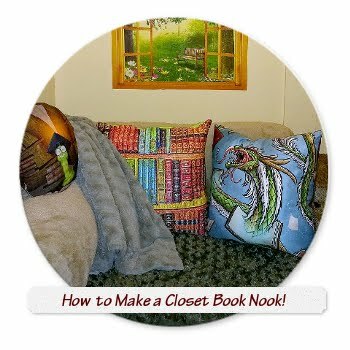 When I was offered a review of Crazy Aaron’s newest Thinking Putties, I was excited and knew my kiddos would be as well. We received the Phantom and Super Magnetic putties and think they’re both really fun. The Phantom putty comes in two kinds, Foxfire and Arctic Flare, and both react to a blacklight (included). 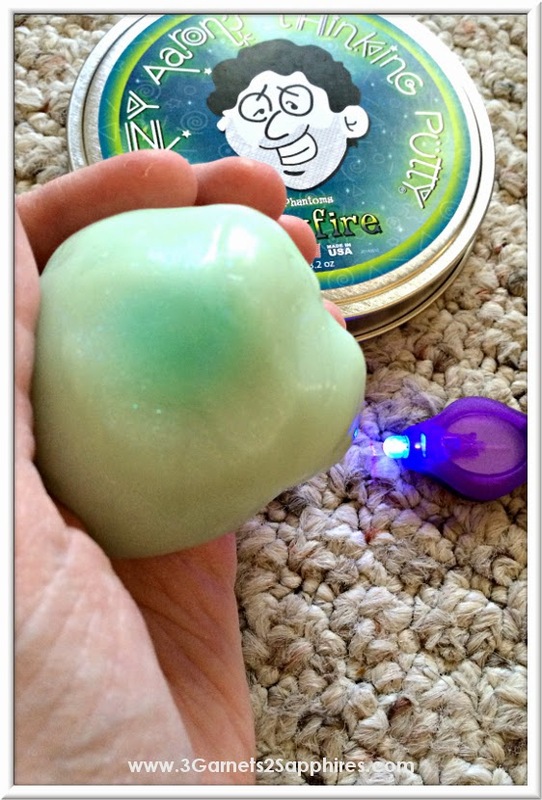 We received Foxfire Thinking Putty and it’s green in color until it meets the blacklight when it then becomes blue. This Thinking Putty is really fun and the kids have loved writing messages to each other and decorating their creations with faces, eyeballs, etc. The Phantom putty is really cool and provided my children with hours of entertainment. The Super Magnetic Thinking Putty comes in four varieties: Tidal Wave, Strange Attractor, Reactive Razz, and Quicksilver. 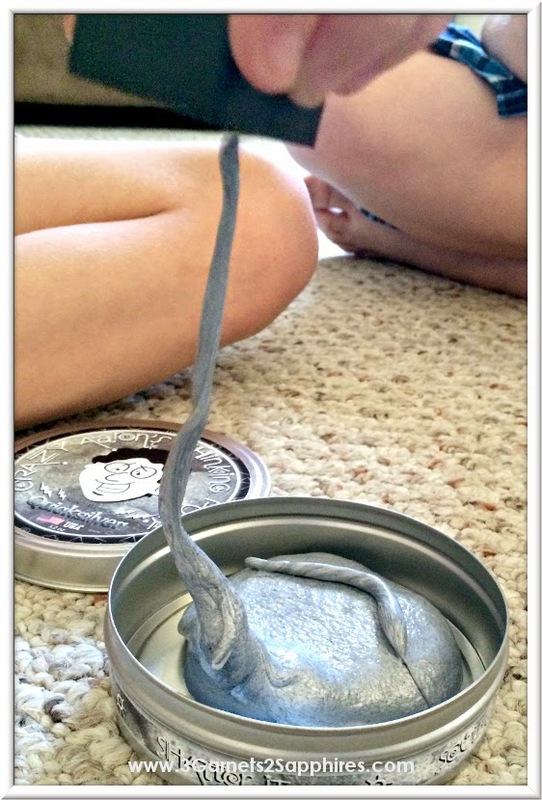 We received the Quicksilver and were instantly captivated by this unique Thinking Putty. This putty comes with a ceramic magnet that you can use to “charge” the putty and make it magnetic. From there, the possibilities are endless! 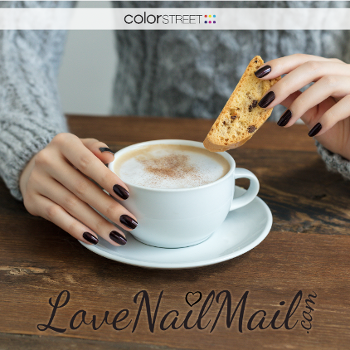 You can pick up small metal objects, such as paperclips, make it levitate with the help of the magnet, and more. This putty is really cool and my kids started experimenting with what kinds of things they could pick up with the magnetic putty. All of Crazy Aaron’s Thinking Putty products are very well made and come in their own storage tin. 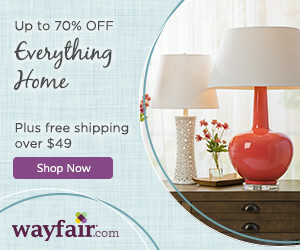 They retail for about $14.95 each on their website, www.puttyworld.com. 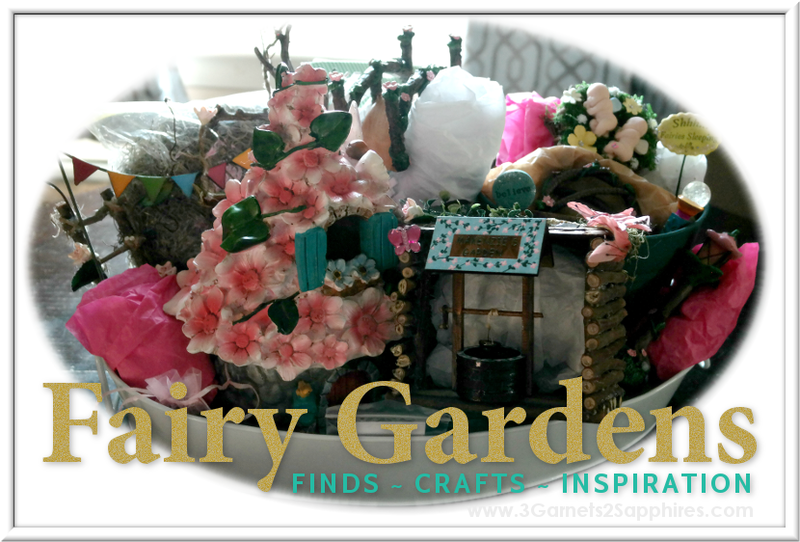 You can learn more about Crazy’s Aaron’s products there or on their Facebook and Twitter pages. These little tins of fun would most certainly make a unique stocking stuffer or Easter basket toys!